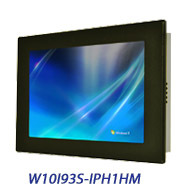 In order to provide customers more various and economical Panel PC, Winmate is going to release a series of HMI PPC products from now on. Customers can choose from POE, ARM-11, to PC-HMI series according to real demands of functions and platforms. 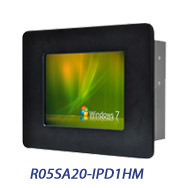 All HMI products include IP65 front bezel design and touch screen. Below paragraphs will focus on features of each series. With Intel Z510 Processor and I931 mother board, there are three sizes of PC-HMI: 5.7", 7" and 10.1". In addition to general I/O like two RS-232s (one can be chosen as RS422/485), two LANs, one VGA and two USBs, PC-HMI products provide customers to be able to select optional 2-channel CAN. Nowadays, POE products are getting popular due to their flexibility and cost saving. Without installation of power and adapter, POE PPC can work depending on its RJ-45 cable that can transfer data and power simultaneously. The feature can overcome power-related problems so PPC can be installed anywhere without being limited by power. Moreover, users can save expenses such as power installation fee. POE can be broadly applied to industrial control, retails, and any fields where network via LAN is needed. 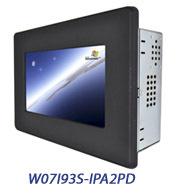 Winmate supplies 7" and 10.1" POE. CE and Linux users will be interested in another HMI product: ARM series, which uses Samsung 6410 Processor with built-in Windows CE6.0 and Linux 2.6.24 OS platform. The small size (5.7" and 7") are designed for small-size operator interface applications.